It's vacation season, which unfortunately means you are probably looking for a bathing suit. I feel your pain. 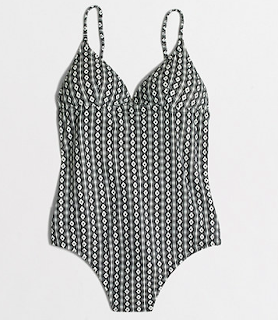 Good news though, one pieces are super in right now and with the right pattern and cutout, they can be downright stunning. I love the lines, shape, and pattern on this suit. It's got pop. Trina Turk under $100? Go, buy, now. Only this price today. Gotta get on this colorful beauty. Gotta love this price for a beautiful all over print. Vacation ready. So get the sunscreen and get shopping. These one pieces are on major sale because it's mid-summer and that means you win!